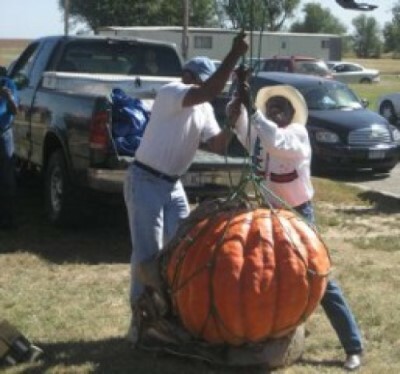 Robert Alexander and Val Williams hoist the giant pumpkin up to weigh it. The folks are gathering for the festival. 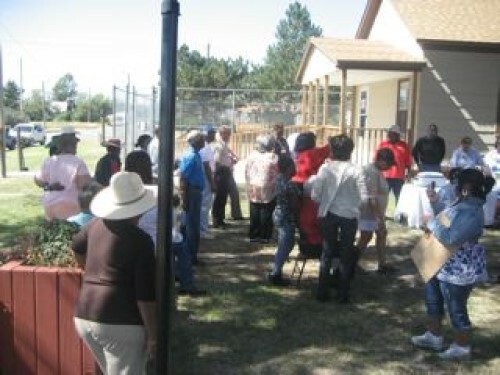 The crowd waits for free chili prepared for participants. Barrie Tompkins giving a horseshoeing presentation. 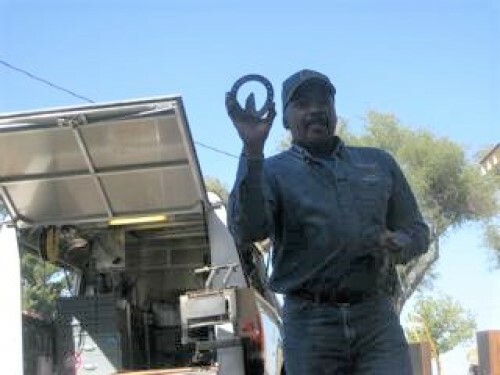 Barrie Tompkins, professionally farrier demonstrates the making of a horse shoe and tells stories of working on Kentucky race tracks and horse farms. Herb Rhodes Nicodemus Cowboy of the Year. Herb Rhodes receives Nicodemus Cowboy of the Year Award from Angela Bates. Herb the first black to serve on the Nebraska Cattlemen Association Board. Brothers, Gary and Robert Alexander proudly show off the giant pumpkin. Robert provided the seed and Gary grew and nurtured the giant. Angela congratulates Bertha Carter for her exact guess of 335 pounds for the giant pumpkins. She receives a pumpkin pie as an prize. Pioneer Day usually the first Saturday in October, has been held since the early 90s, with a different theme each year. In the early years large bake sales were held to fund raise. Demonstrations and historical character presentations were also included. The large pumpkin weigh-in had everyone guessing its weight. Bertha Carter won the pumpkin prize pie, by guessing the actual weight of 335 pounds. Descendent Herb Rhodes (deceased) received the Nicodemus Cowboy of the Year award one year. He is the only black to serve on the Nebraska Cattlemen Association Board. A free chili feed has been added to feed participants. James Bates (deceased) provided his famous homemade chili for years.